Cool and convivial or chilled out and arty. Our unique Hostel is located on the ground floor of the old Edwardian police station. 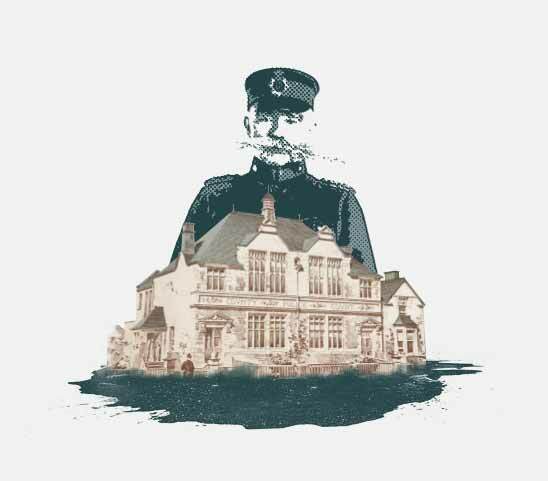 The 1911 consensus states that the house was occupied by Stephan Owain Chief Constable with his wife Agnes and daughter and now for the 1st time since late 70’s guests will be able to sleep in style in this historic setting! All our rooms have been created to celebrate the unique language culture and history of Bro Ffestiniog. All bunks include private storage and electric sockets and personal lights for your bed time reading! bathroom facilities are shared. Prices include all bed linen bar towels which can be hired at reception if you don’t have your own. Please Contact us for more details as you cannot book this online. Small & compact our kitchen offers guests the ability to cook for themselves. Disabled toilets & showers offering access to all. We are proud to boast that we have the securest lock up in town based in the old cell’s… Sleep tight knowing that your bike, kayak or climbing equipment are in the safest place in Ffestiniog. Have a drink or grab a bite to eat in the bar or watch s film in our in house cinema or chill out and read in your room; cook in the kitchen; sit outside or inside; watch TV or check out your Instagram. Breakfast is the most important meal of the day so enjoy it how it suits you. Continental to your room (pre book). Continental in the cafe (pre book). In the centre of Snowdonia, North Wales, Blaenau Ffestiniog is the heart of the national park. Rugged mountains with people, culture, activities, attractions, food and entertainment that is arresting. No finger prints necessary but here is the fine print if you would like to read it. For details of our hostel policy see – Hostel terms and conditions. Super easy to get to by train, bike, bus or car. Located in the centre of town, 5mins walk from the train and bus station. GETTING HERE PAGE. CellB has onsite parking facilities.